Listen as President John F. Kennedy delivers his famous inauguration speech in 1961 as well as speeches on the Cuban Missile Crisis, Berlin crisis, space exploration, civil rights, "Ich Bin Ein Berliner," and more. 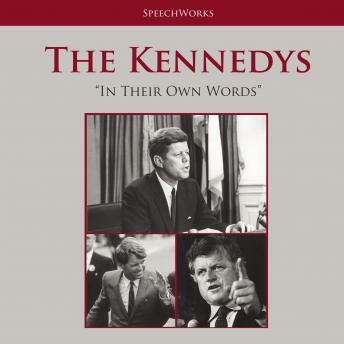 Also featured are twelve speeches from Senator and Attorney General Robert F. Kennedy, including his address to the DNC following his brother's assassination, remarks on Vietnam, campaign speeches, the death of Martin Luther King Jr., and his "Victory Speech" in Los Angeles moments before his assassination. Among other speeches are Senator Edward Kennedy's eulogy for his brother Robert, his famous address to the DNC in 1980, heated debate on the Senate floor, and his final public speech in 2008 at the Democratic National Convention.